What is the Maxwell Meiborg Foundation? In August, 2006, our two year old son, Max was diagnosed with medullablastoma, a malignant brain tumor. Following surgery to remove the tumor, Max endured 15 months of chemotherapy and 30 consecutive days of radiation treatments. Within hours of Max’s cancer diagnoses, our wonderful family and friends rallied to provide an amazing amount of support. In October, 2006, a golf tournament was organized to help offset initial medical costs. The event was not only a financial success, but also an opportunity for us to personally thank those who helped get us through those difficult first months. We recognize how fortunate we are to be surrounded by such a strong support system. We wanted to extend that blessing to other families. Each year we will host the Maxwell Meiborg Foundation Golf Tournament. All proceeds will be used to support organizations who share our commitment of helping families who are battling debilitating pediatric diseases. Primary amongst these is the Make A Wish Foundation. 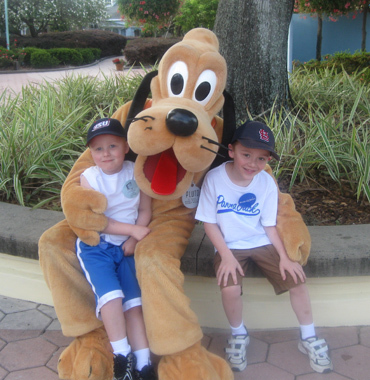 Each year, our goal is to fully fund the cost of one child’s wish. We thank the individuals and businesses who have helped us reach this goal each year! If you are able, we encourage you or your business to join the team for this year's event. We are a 501(c)3 organization.